Here is the most powerful version of the CP type 17,5mm of POLINI MOTORI, the CP carburettor is a high performance model, made in Italy 100% and not in China, high quality that is easier to adjust! Unlike the standard model which is reserved for configurations not exceeding 13,000 towers! This CP EVOLUTION releases its performance and feeds without problems between 12 000 and 15 000tours! It is ideal for a configuration G1 (except competition because limited to 15mm) well pushed on a PEUGEOT 103 or MBK 51 for example! This version is evolution, it does not have separate greasing, no grip for the depression and a choke lever lever that you can switch to cable if desired. 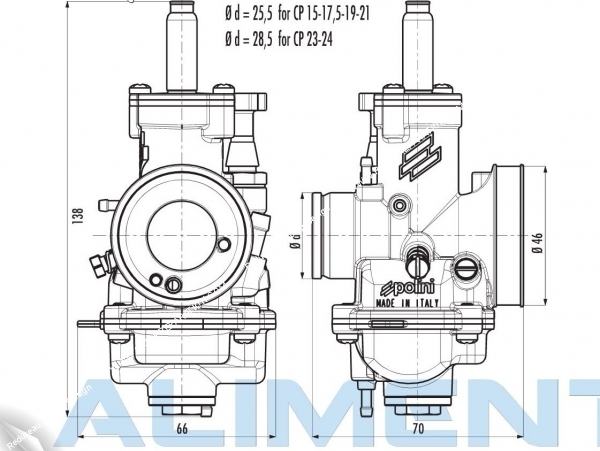 Basically, when you start on a carburettor POLINI CP, we already know that we buy a carburetor much lighter than a DELLORTO, with a much better anti-emulsion worked, a still aluminum tank, an extra ordinary finish, easier settings, an excellent system of anti-leakage needle valve float .. Yes but that brings this version EVOLUTION carburetor report to a standardized CP! First, the body of the carburetor is worked, entered with a better finish, machined output conically in the spirit of the BIDALOT LABEL of the time. A tank cap is present for a faster change of settings without disassembly of the tank, a big diameter tulip machined steel (damage that it is the steel seen the weight but you will be able to put an aluminum) is delivered to you to ask the big filters in Ø60 / 61mm, the bushel is a D / 24mm, cut 40 ° against the cut 30 ° normally, jet 106 against 90 and surroundings normally. The needle is a CP 14 22, after a special well in 17 - 19/23! 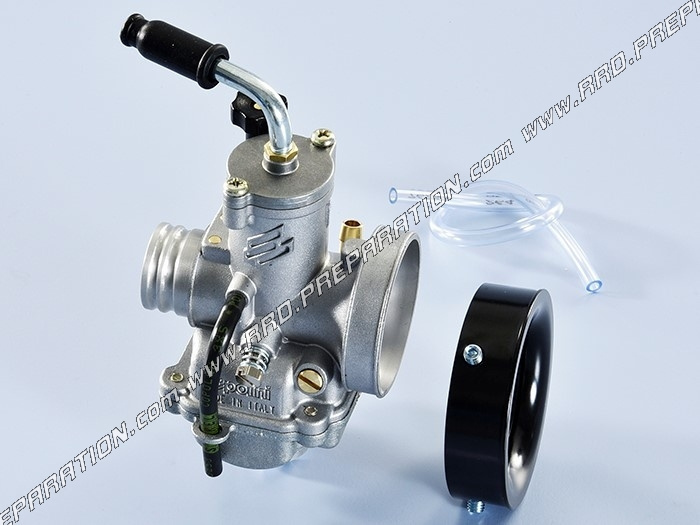 You will understand, it is a carburetor resolutely racing provided for very powerful engines in 50 or even 70, 80cc ... All these parameters make it the lightest and most efficient carburetor Ø15mm market! A superb carburetor.